This is an email course for all wedding entrepreneurs including wedding planners, wedding florists and wedding photographers. If the word sales makes you cringe and your stomach do flip flops, this course is for you. Let's be honest, none of us started a wedding business because we love doing sales. We started wedding businesses because we love weddings, we love making couples happy, and we love being creative. Making money doing what you love sounds pretty awesome, right? Of course, it does! Wedding sales don't have to be painful! They don't have to be pushy, sales-y or annoying. Once you understand who your ideal client is and the basic pieces of your sales, you will feel comfortable talking about your services and couples will book. Guess what, that's sales! I used to hustle hard for every single sale, spend an hour on each inquiry call, then another hour crafting a detailed proposal with too many options with a contract and then the client wouldn't even book. It was exhausting, frustrating and time-consuming. But once I stopped trying to book every client with a credit card and a pulse, things changed. I started to focus on the type of client that wanted my style of wedding planning services and, everything changed. The key was that I simplified and specified my marketing. 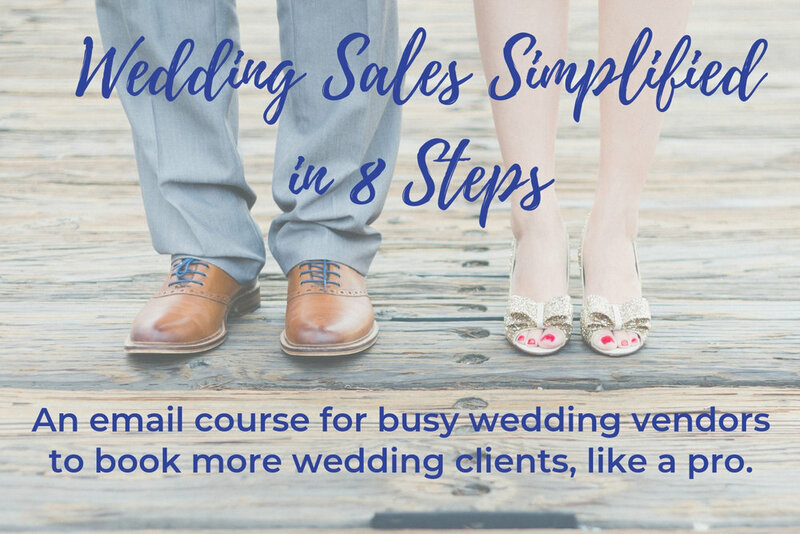 are you ready SIMPLIFY YOUR WEDDING SALES? Sign up now to get on the VIP list and be the first to know when enrollment opens. NEWBIES that are uncertain how to start booking, are struggling to focus their marketing efforts, and/or need help selling themselves. WEDDING PROS that want to freshen up their marketing, polish their sales style, and get fresh ideas to stay competitive. No matter where you are in your wedding career, this course is designed to sharpen and focus your marketing building blocks so that you can book awesome clients. This is an email course. After signing up you still start to receive emails. do you offer refunds or guarantees? You have 14 days from the date of purchase to request a refund. In order to receive a refund you must show us that you put in effort and implemented everything in the course and gave it your best. can't i just get the info for free somewhere else? Honestly, probably! But that would be super time consuming (and you’re super busy), may or may not be from someone who is in the wedding business, and won't be conveniently saved in your email inbox to refer back to. do i need special software for the course? No! You just need your email inbox. It does help if you have a website up already, Facebook Fan page up already and Instagram up already, but it is not crucial. Since you will have the emails in your own inbox, you can refer back to them at any time. Hi! I’m Lindsey. I’m a wedding planner and business coach for wedding entrepreneurs. I’m here to help you book awesome clients by guiding you on the business piece of running your wedding company. If you want to have more fun in your business and focus on being creative, I’m your gal. If you are a dog person, even better.